MEGAN HALL: It's definitely not easy to balance earning a PhD with working full time and having a family. However, I feel that Walden's clarity makes it much more possible. Walden's extremely clear about what the expectations are for a course. Even before the class starts, I can go online and see every single assignment that will be assigned throughout the entire course. I can see the rubrics that will be used to grade it. I can follow all the steps I need to take at my own pace, at my own time. So if I'm lucky enough to have an afternoon free, I can work ahead. And then I can sort of take a few days if I have late-night conferences at school. It's OK. I worked ahead. I can take a couple nights where I'm just focusing on my professional role. I would also say that the way that the learning has been structured for me dovetails really beautifully with my professional work. So oftentimes, whatever I'm researching and writing about and discussing in online posts matches what I'm doing at work. And so it makes my work better. I've never had a supervisor say, I wish you would stop spending so much time on your graduate work. Instead, I'm contributing more to the team, because I'm benefiting from the instruction at Walden University. 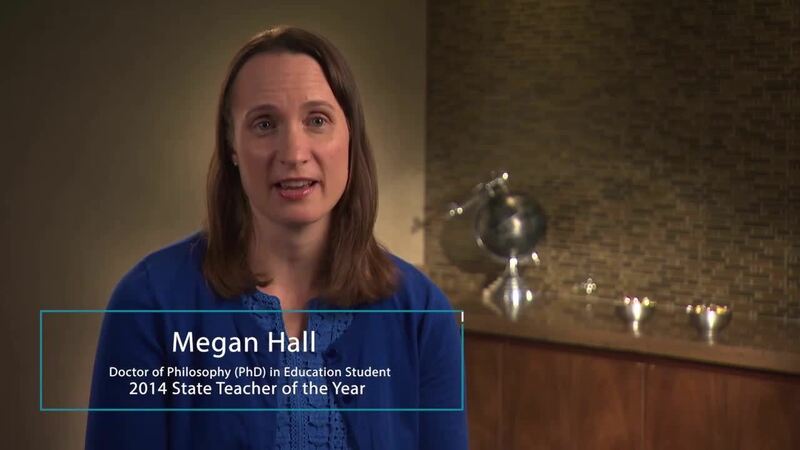 Megan Hall, 2014 Minnesota Teacher of the Year, shares how she balances her PhD in Education program with family and work responsibilities.